As the Iway project winds down, one of the next big planned highway projects in Providence is the Route 6/10 interchange in Olneyville. Much like the Route 195 relocation, the Olneyville project is necessary due to the age of the structure. The bridges and viaducts have reached the end of their useful lives and need to be replaced. Also, RIDOT seeks to complete the missing connection from Route 10 north to Route 6 west. Unfortunately, the website RIDOT had set up to explain the different alternatives for this project is no longer active. The basic plan would be to move Route 6 slightly south onto the National Lumber and First Student Bus Properties (which they were not happy about). This would allow the existing viaduct to be torn down and provide room to make that missing north/west connection. The REBOOT proposed here is more to do with reconnecting Olneyville Square to Federal Hill and the West End, and focuses less on Route 6/10 (though they get extreme makeovers in this plan too). My plan does not create the missing north/west connection, but with some more noodling of the plans, I’m sure it could. 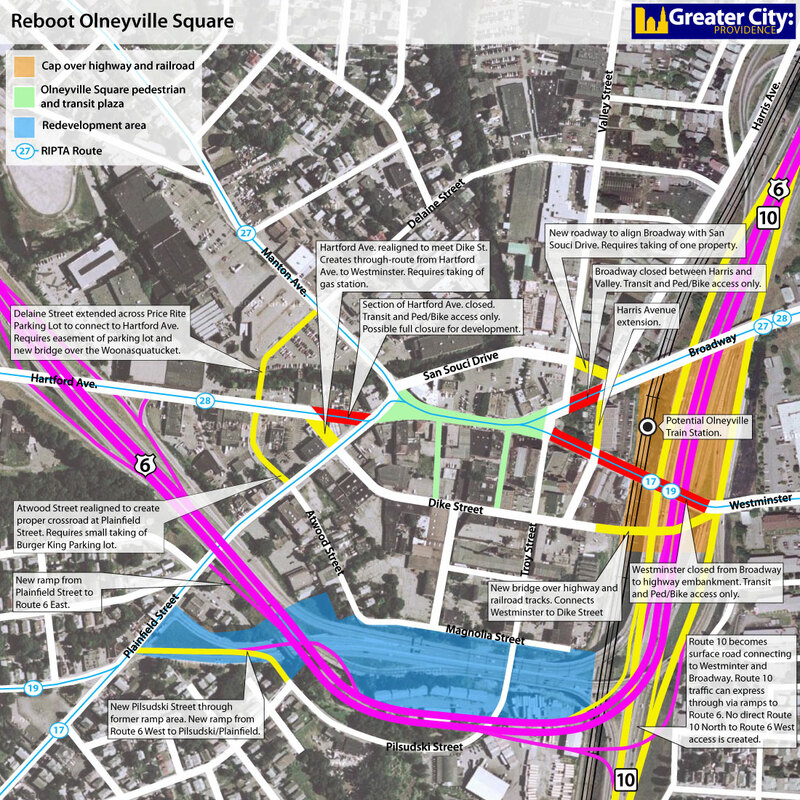 The key to this REBOOT, is closing down Olneyville Square to traffic, and turning it into a pedestrian and transit mall, with some substantial rerouting of area streets to move cars about the area, without moving them through the square. Of course anyone familiar with Olneyville Square will know, currently traffic doesn’t really move through the square very well. I think the technical term is clusterf*ck. So let’s work through some of the pieces of this plan. As stated, the square proper is closed to traffic, allowing only buses (and eventually streetcars), pedestrians, and bicycles. Some of you old timers may be remembering the pedestrian mall on Westminster Street and will blanche at such an idea. The pedestrianization of Westminster Street didn’t work. Correct, it didn’t, but it may have been an idea before it’s time, and the pressures of suburbanization that were emptying Downcity were just too strong. Olneyville is a different beast though. As of the 2000 Census, over 40% of the households in Olneyville did not own an automobile. Also, only 3.4% of the people living in Olneyville, work in Olneyville. So these carless people who work outside the neighborhood are much heavier transit users than the city as a whole. Currently the buses get stuck in the same horrendous traffic that everyone else gets stuck in. Removing cars from the square allows the buses to move through the area fast to better service that 40% of households that lack access to a car. Pedestrianizing the square creates more space for retailers to sell their wares on the sidewalk and creates a much more user friendly business district in the square. The fast and frequent bus service will potentially attract people from other parts of the city allowing Olneyville Square to again become the western retail and business anchor for the city. 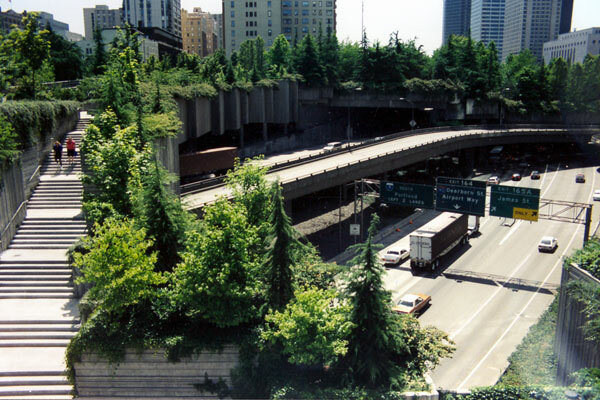 Seattle’s Freeway Park, built on a deck over Interstate 5. Photo from the City of Seattle. In this plan, Route 10 from the south would rise up to the level of Broadway and Westminster and become a surface street. Ramps would allow it to connect to/from Route 6, which would go in a cut below street level which could potentially be covered and developed. This would close the wound that the highway currently creates separating Olneyville Square from the West End. The existing section of Westminster Street from around about where the Skurvy Dog is to where it currently intersects Broadway would be closed and reserved for bus/bike/ped traffic only. Westminster would be re-routed to a new southerly location and connect to Dike Street, creating a southern bypass of the square to Plainfield Street. A small realignment of Hartford Avenue would allow traffic on this southern bypass to flow directly onto Hartford Avenue, and eventually onto Route 6. All without the current traffic congestion in the square. The realignment of Hartford Avenue requires the taking of a gas station currently at the corner of Hartford and Plainfield. Broadway travels over Route 6 on it’s current path, but gets diverted onto a new roadway at Harris Avenue. This new roadway connects Broadway to San Souci Drive and diverts traffic north of the square. The new roadway requires the taking of one or two properties. A new portion of Harris Avenue is created in front of the housing highrise to allow for through traffic from Harris Avenue directly to Dike/Westminster Streets. The Price Rite Plaza present a spectacular redevelopment opportunity in the heart of Olneyville Square. With the number of buses passing through Olneyville Square it is a fantastic location for Transit Oriented Development. Redeveloping the store and it’s parking lot for housing and jobs will put people steps from the major transportation hub. Delaine Street would be extended through the Price Rite parking lot and connected to Atwood Street. This connection creates a half ring road around Olneyville Square which will further keep through traffic out of the center of the area. The owners of the Price Rite Plaza would have to agree to pushing the road through, and a bridge would need to be built over the Woonasquatucket to allow the connection to Atwood Street. Currently, when one heads south on Valley Street, one runs into the tangle of traffic at the intersection with Broadway and Westminster. With Broadway and Westminster rerouted, Valley Street traffic passes through easily to Troy Street, only having to interact with bus/ped/bike traffic at the square. Further south Troy Street becomes Pilsudski Street, and Pilsudski gets a new extention south to Plainfield Street. This creates a strong north/south path through Olneyville. 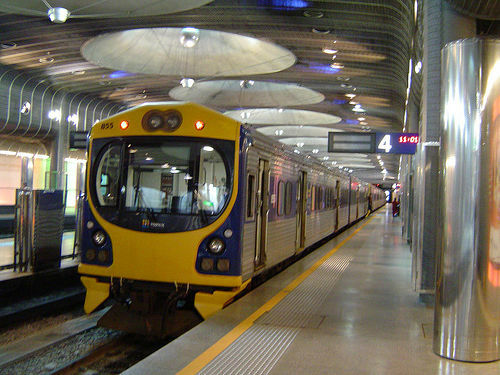 DMU train in Aukland, New Zealand. Photo (cc) James Pole from Wikipedia. Planning talks continue for future commuter rail service from Woonsocket to Providence and points south. my proposal calls for DMU service from Woonsocket to Quonset Point with a stop in Olneyville, the station location for such service is illustrated on the map. Olneyville Streetcar, photo (cc) Providence Public Library. Broadway is an obvious candidate for future expansion of Providence streetcar service. The transit mall at Onlyville Square makes that service even more attactive and the development potential in the immediate area means that such streetcar service could be a strong economic generator. This may all seem like a lot of work, and well, it is. But aside from the extreme engineering of moving the highway and possibly decking it over at the east side of the square (and the train station and streetcar), it is really simply a collection of smaller interventions. And the extreme engineering of the highway is happening regardless. So while we get ready to put focus back on this highway project again, isn’t it a good time to start to ask how the highway project can benefit the neighborhood? Great plan! I especially like the train station/streetcar aspects because I’d benefit from that! Another place for a train station – over by Charles and Silver Spring. It’d make my commute a piece of cake. Excellent plan. A pedestrian/transit mall would be great. There would be an opportunity to infill all the parking lots that have taken buildings from the square since the 70s and once again fill it with retail shops. At the turn of the last century the city had 8 train stations, three of them were in or around Olneyville. There would be a great opportunity with bus, rail, and streetcar improvements to add serious residential and commercial density to the square. By the way, Westminster Mall was enormously successful from when it was built until Shepard’s filed bankruptcy in 1974. Besides downtown Shepard’s had a store in Warwick at Rhode Island Mall (formerly Midland Mall). Suburban retail did take its toll on the city, but what’s often overlooked or conveniently ignored is the 1973 oil embargo and energy shortage that triggered a deep recession. The recession along with suburban retail killed Shepard’s and that was the beginning of the decline of the mall, not before. Downtown also refused to compete with suburban retail that was opened to 10 p.m. every night and offered free parking. parking, parking, its always f@#%*&g parking with Rhode Islanders. Look at what NYC did with Time Square & Broadway and like a millions car go by each day! Time Square is an unfair example. It’s not exactly Rhode Islander’s fault (though possibly General Motors and Firestone). It has been mostly about parking since the dismantling of streetcar system in 1948 and discontinuing of the Westerly commuter train and Boston commuter train (which stopped in Pawtucket) in 1983. Buses unfortunately don’t have the same appeal and functionality as rail transit and RIPTA is grossly underfunded today. A commuter rail system is now being rebuilt. Aside from operating expenses a streetcar system could be reinstalled roughly for what it cost for the Iway project, but is there the political will to pay for a system? Maybe after the starter streetcar system is built in five years. Both commuter rail and streetcars would help to reinvigorate Olneyville, which was built as a result of rail transit. Changing land-use regulations would be another critical ingredient in rebuilding the district. Besides losing rail in Olneyville, auto culture has been one of the more destructive forces on the square. First, with the lack of vision in the 1950s with not installing a Route 10 north to Route 6 west exit ramp and second, the destruction of buildings to create parking lots. Jef’s plan offers a dynamic possibility of how the square could be improved to engage pedestrians and transit. The plan would create effectively two major east to west streets; one major north to south; and one north to west street that would ease and distribute non-transit automotive traffic around the square rather than through it. The land that will be re-exposed after the existing viaduct is dismantled will offer new development sites to expand Olneyville in the same way that a relocated 195 is expanding Downtown, the Jewelry District and Fox Point today. What uses or industries might be sited on that newly available land? “Transportation” spending has been synonymous with highway spending for a long time. Commuter rail is certainly progress, but Wickford Junction is a park and ride by a strip mall. The assumption remains that everyone will always leave home in a car. This proposal for Olneyville is a beautiful example of the comprehensive thinking that must guide big-ticket transportation projects from now on. It addresses tens of thousands of people’s need for improved access and mobility using money that would otherwise be applied only towards speeding up car trips from the suburbs to downtown. I hope people in charge are paying attention here. You mention the 2000 Census, “over 40% of the households in Olneyville did not own an automobile.” Well that’s because they are mostly poor people and they can’t afford a car and mandatory insurance and it’s not because they prefer to walk in sub zero freezing temperatures to the corner market! You also state, “only 3.4% of the people living in Olneyville, work in Olneyville” Well there are not many jobs left in Olneyville due to crime and that fact that 99% of the old mills moved to China or Mexico. While this might be a true assessment now, how many of these poor transit users will be left in Olneyville once they turn it into a high rent yuppie paradise? Maybe we could ask the poor people who live in other sections of Providence that have been “rebooted”? Oh…they had to move to places they could afford like Olneyville…nevermind. After a year or so they will have to re-open the street so the BMW and Mercedes owners can drive to their fab artist loft condos. I thought the reason car ownership was so low was self apparent, but I agree, no one likes to walk around in sub-zero temps if they can avoid it, hence the need for improved transit services. Nowhere in my post did I suggest that we clear out Olneyville and only allow people with Mercedes and BMWs to live there. I refuse to subscribe to the notion that the only way we can maintain affordable housing is to maintain slums. Everyone, regardless of income, should live in a safe clean neighborhood, with access to services, both public and private. Richardo, I wouldn’t so confident that Olneyville will be turned into a “high rent yuppie paradise” with BMWs racing around so quickly. Much of the formerly vacant parts of Olneyville have been redeveloped by various non-for-profit housing groups that have built new affordable housing units. Many of the people that live in those units would be classified as poor. They won’t be going anywhere if the neighborhood changes. This discussion is about how Olneyville could be improved as well as the city in general. One way to address your point might be to suggest that any new residential development in Olneyville be required by law to provide a specific percentage of housing units as “affordable.” The number of 20% is often used in many cities. The reality is that another poor neighborhood the West End/Armory has been “gentrifying” for three decades with limited success. Rents have not gone up for the most part based on city averages, in fact rents many have actually declined. The “yuppies” that have moved or bought into the neighborhood have to some extent stabilized it. Those “yuppies” are often younger who couldn’t necessarily afford to live in more affluent parts of the city. Earlier neighborhood pioneers took large economic risks investing in the neighborhood and they have assisted in its rebuilding. There is no advantage in keeping Olneyville in its present impoverished condition by not proposing something new. Transportation improvements historically have been the best way to kick-start revitalization anywhere. A new job base needs to be created. Many of those jobs whether high or low paying won’t be like the industrial jobs of the past. A healthier prospect for the city is to rebalance the socio-economic mix. To improve the school system and create new jobs that would benefit all people in the city, the middle-class needs to be offered more enticing alternative to suburban lifestyles. An renewed Olneyville could be one of those options, but only if it doesn’t push out the existing residents. The rehabilitation work done on the old warehouses on Valley was a necessary move because these buildings were literally falling apart, but the rehab prices for these new sites are out of range for “local artisans” that they have been left empty or are used by upwardly-mobile professionals. And I don’t see these professionals coming into Olneyville Square (just down a couple blocks) to eat at the sandwich shops, buy their newspapers, or anything else. They get in their cars and drive back to the east side where they live, to spend their money. Each investment for improvement is currently functioning as a bubble. The community of low-income and various ethnicities in Olneyville are generally ignored when it comes to investment for the future. Improved access, egress and transportation is fantastic and important, but I personally would be focusing on bringing in real businesses that create jobs and improved public education. The area needs vitality through commerce and income. Someone needs to work hard to bring in some real “anchor” businesses. The people are so poor there, that Shaw’s left after being there for about 2 years! And the one elementary school in the area, Perry Middle School, is being closed because of lack of funds available for repair. “Improved access” and “bringing in real businesses” are not either/or propositions. The priorities of a large DOT project are the focus here. The “someone” who “Needs to work hard to bring in some real ‘anchor’ businesses” is not the DOT except insofar as DOT ought to provide transportation infrastructure designed to serve, instead of bypass Olneyville. As a design for the physical environment, I think it meets the needs of the Square dead on. As Peter Brassard points out, much of the Square was built around train depots and streetcars, not high volume auto traffic. If you’re there at any point of the day, though especially rush hour, the place is a parking lot, and for what reason? Also because it’s located in a valley, the car smog just sits there. One spring, I was smelling someone’s violets they had planted on a nearby street, and the flower just smelt like exhaust fumes. The strong point of this plan for me is the bus service. If a bus lane were added onto Broadway to connect up with the Square, it would provide a comparative lightning speed service between Olneyville and downtown, as well as other locations. This in turn would provide the 40% of people who depend on the bus for transport, an opportunity to have more flexibility in their schedules, since they won’t have to worry about catching a bus that can only make it there twice an hour. It’s never going to happen. I spent almost 2 years pursuing an entertainment venue/artspace/recording studio I wanted to build in Olneyville. Something truly revolutionary. I watched over the last two years as every investor has fled the state. The major company who was overseeing a lot of the property development in the area (the name eludes me at the moment) has pulled out because the entire area has become “non-viable”, as the subsidies have dried up and property values crashed. I hate to say it – I was looking forward to being an olneyville resident for two years – but I think the garden is barren. Now I”m fleeing the state myself. Nothing good is going to happened here for a long time to come, I’m afraid. Rattlehead, it’s really too bad that you’ll be leaving. I wouldn’t be so sure that nothing will happen, though it’s unlikely much will happen in the next six months or even a year pretty much everywhere. There’s very limited available capital for investing in real estate or other business ventures throughout the country. There’s a movement among Rhode Island leaders to bring back the historic tax credit during the next session of the General Assembly. That tax credit in large part the main driver behind billions of investment in Rhode Island during the boom, if the tax credit comes back so will investors. Rhode Island’s unemployment is high though not the highest. Other than a more positive attitude in other regions, whether it’s New York, the South, California, or Seattle the situation looks similar as it does in Rhode Island with a large segment of the workforce unemployed, vast stretches of retail vacant, and 15 to 25% vacancy rates on office space. In New York it might not be an exaggeration to say that may be 50 or 60 million square feet of vacant office space. Downtown Providence has a little more than 6 million square feet in total. I believe the large developer you were referring to that has pulled out is Struever Bros. Eccles & Rouse Inc. of Baltimore. Struever Bros. is overextended and broke like most developers today. The reason why a Baltimore developer was in Providence to begin with was the historic tax credit. The EDC’s financial loan guarantee for 38 Studios to relocate to Rhode Island that will bring 450 high-wage jobs will change things, as will other initiatives. An earlier initiative where actual job growth has occurred, even in the economy, has been at Quonset. The Quonset Business area was first viewed as extravagant waste of resources, which has turned out to be a false assumption. The garden may be barren, but some seeds have been planted to see it grow one again. Olneyville could be another one of those seeds. After my comments this morning, I wonder if rattlehead might be right after all. The EDC loan guarantee for 38 Studio is being sidelined by Caprio; the Deepwater Wind project off Block Island is headed for the state Supreme Court and the prospects aren’t exactly promising; and as Dan pointed out a proposed aquarium in Rhode Island might be a dubious venture at best due to regional competition and especially with using state funds rather that private equity to build the project. If the voting public turned down a referendum for the Museum of Industry several years ago, why in a bad economy would they authorize an expenditure on an expensive aquarium? It is a little weird that Moffitt, a Republican gubernatorial candidate, would propose spending tax payer money on such a high-priced tourist destination. The proposed waterfront hospital, medical office building, and hotel could provide many good jobs and would reinforce the developing medical/biotech economy in the city. Proposed zoning changes that would allow it have been routinely met with resistance because such a project potentially would spoil the traditional industrial waterfront. I am generally optimistic about what can and might be achieved through planning and policy interventions, but I can’t say that the current news offers very many positives for the immediate future. What other possibilities might there be that could create a healthy vibrant economy in Rhode Island? I am trying to think of a project that lifted up a community the way we all hope something in O’ville will, and honestly for the life of me, I can’t think of one. Perhaps I’ve just been gone too long and because I’m now living in a soulless suburb where new buildings and developments seem to go up on a weekly basis (with complete lack of any kind of center of community) but I believe that the kind of changes that lift a community are the ones that happen from the ground up, not the top down. Broadway and Westminster, Armory, Eagle Square–they all became desirable places to live and work not because the city dumped a ton of cash down there, or because some developer rode in on a white marble horse and built something, but because of sweat equity, some risk-taking by regular people and the creative class. Those things created a buzz around the area–I will be the first to admit that I moved to Federal Hill (off Broadway) because of Julian’s (and because it was affordable to working class people–of which I was one) and friends and colleagues followed and then we had Nick’s and Clementine, and Suzy Crosby and the Decatur etc. Some of those places are gone, but they have been replaced by equally valuable retail. Some may cry gentrification, but at least working class people making a better neighborhood for themselves and their neighbors is more organic than some stranger or the city throwing a bunch of cash down there and then sitting back and waiting for the magic to happen. Of course the question is how does it happen? What is the tipping point that takes a neighborhood like the one I was living in where houses were selling for less than $30K in the late 90s turn around to become someplace desirable? with their parents. It just takes time. Though I’m glad there’s the dedication. Jef, I like many of the elements of your plan. I have been at meetings in which there have been talk of some of these but it is great to see everything together in one place. I love the idea of Delaine St. Connecting with Hartford Ave. Troy St. Connecting with Valley and Broadway is another one I believe will help with Olneyville traffic in the meantime. While RIDOT is lacking funds to act on this would be the perfect time to plan for a design that improves the neighborhood as much as it improves the highway. I really like this plan of yours, Jef. I think I’m going to make some minor adjustments and then get back to you. Thanks for the inspiration! I own 50 Agnes, a building 30′ from Dike St. Your plan to reroute Westminster-Hartford/Plainfield through Dike St wont work. If you were familiar with the neighborhood, you would know that Dike St is only 1.5 lanes wide, so dumping 3 large roads into one narrow one, making it into serve as a major artery, is physically impossible. The same is true for Magnolia St. Likewise, removing all cars from Olneyville Square means all that parking is gone and not replaced. Also, Dike St ends right at the train tracks, and so does one of the buildings alongside. To cross the tracks and leave enough room for trains to pass underneath requires that a bridge start about a block back and close off the front of that building. Olneyville Sq is obviously over subscribed. The best way to alleviate the crush is A) create a Rt 10 North – Rt 6 West connection and B) make more small connections, capillary-style, between the peripheral streets. These peripheral connections cannot replace the major Olneyville Sq artery, but they can take some overflow. A related design disaster is that Providence does not have a ring road. Rt 10 should have connected through 146 to 95, and 146 should have a 95 north exit.